The famous Villa Campari in Sesto San Giovanni, a nineteenth-century mansion once known as Casa Alta and for decades the representative office of the old Campari production facility, now houses a fine restaurant. A stylish, modern setting in which, in line with the great tradition of Campari, food, art and design come together to offer customers a unique, memorable experience. 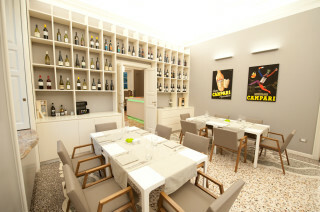 The rooms at Villa Campari Restaurant house a total of 150 seats. They have been decorated in a modern, refined style so that the customer is immediately at ease. The menu is based on good, affordable Italian cuisine.